Hello faithful blog friends, I have not forgotten you! With the deadlines and activities of this past summer there was no time for the blog. Now I’m back in a routine of teaching and drawing and will be able to make blog posts part of my schedule. In the coming weeks look for a series on perspective. But first, you might like to see what I’ve been up to. There was a lot of drawing going on! I participated in three Plein Air Competitions, a studio tour, and delivered new work to my galleries. I especially enjoy the Plein Air Competitions because I do nothing but draw all day in gorgeous places. What could be better? 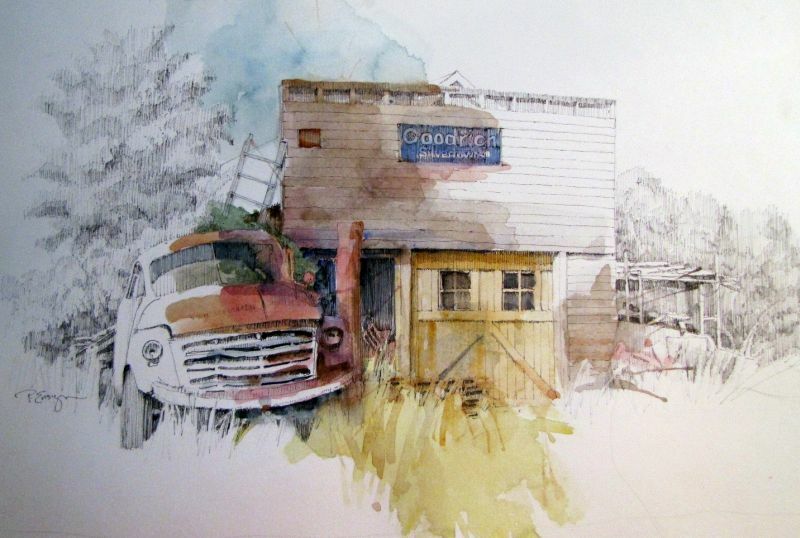 Two of them, Pacific Northwest Plein Air and Paint the Peninsula are highly competitive shows of professional artists. I was the only one doing ink and watercolor and it was an honor simply to be there. Paint the Peninsula is a longer event. Seven days of drawing and painting all day long is intense. We were given a 4 foot by 5 foot area on the Port Angeles Fine Art Center wall to show as many works as we could squeeze in the space. The exhibit grows daily as each artist brings in the work they complete that day. I was grateful to have good sales at this event. Below is one of my favorites. I called it Blanket of Fog, drawn at Rialto Beach on a cold, foggy day. And finally, we had a one day plein air event on Bainbridge Island that was well attended and judging by all the beautiful work completed and the many sales, it was a great success. Winning first prize was a lovely surprise. It was a wonderful summer full of local sketching, travel sketching and studio work. Exactly what I love to do! Next Where did that Horizon Line Go? Congratulations! As always, you are an inspiration!!! See you in January for a few weeks. Thanks, Carrie. I’ll look forward to your next visit. Have a great autumn. Thanks, Robin. I always love seeing your smiling face and fabulous art. Hope we cross paths before summer of 2019. Happy studio winter to you too.